When I saw 5 missed calls from Kokka at 5.30 in the morning, I knew Nanu has left …. Nanu is my cousin and Kokka’s brother. Kokka had called me last night saying that Nanu was dehydrated and had been admitted in the hospital. He said that they were giving him drips and he was feeling a little better. But my intuition said otherwise. Kokka and Nanu are my mother’s eldest sister’s sons and cousins I am closest to. Nanu was a special child – he could not speak, except a few words and special sounds, and his mental faculties were not fully developed. His was a 5 or 6 year old’s mind in a 59 year old body. He was pure love though, his heart was fully developed. So many memories come flooding to my mind. The first time I met him was in 1983 when we moved from Shillong to Hyderabad. He had last seen me as a baby and for a few hours refused to believe that it was me, because I was a 13 year old girl. He kept asking Mom about her earrings that had changed as well – she wore a ring and now was wearing a stud. Slowly I began to understand Nanu and then it was easy to talk with him. Then I stayed in their house during my second year of graduation and for some reason I keep thinking about the Hanuman dance that Nanu and I did one day … so much fun. I am also remembering his special radio that would keep conking off every now and then and the whole household was turned upside down till the radio got repaired. His daily fights with Alamelu and questions that he reserved for Periyappa, his dad. He would click pictures with his hands everytime I wore a nice sari and he would be very uncomfortable if I didn’t take bath early in the morning :). Nanu would cross the busy street and reach Amma and Appa’s place everyday when they were in Hyderabad for his cup of tea and a round of gossip :). Just two weeks back he took care of Amma when we had to go to Chennai for a couple of days, and she ended up feeling a little feverish. Nanu had come home to have tea with her and then came back after having lunch, and stayed till our tenant came back home and Amma felt better. He always had uncanny premonition … for nearly a couple of months before Appa had his cerebral haemorrhage and fell off the first floor balcony, he kept telling Appa, not to fall off the balcony and Amma got irritated with him and told him not to keep saying it. Well, he probably knew Appa was going to fall before it happened. He was a great example of how to deal with life … he would ask Periyamma, his mom about when she would go so he gets to eat “Sojji Appam” a sweet that is made during the ceremonies that are done after a person dies. He took everything in his stride. He had a stock of questions that he would ask repeatedly and he knew how to keep time. He also knew every bus that went past his house and almost everyone who came to the Hanuman temple knew him. He had an enviable memory and remembered everything. He loved old Tamil film songs and cricket. He never moped around…. We met him this time when we were in Hyderabad a couple of weeks back. He gave some advise to Krishnan that he should exercise some more since he had gained some weight !! Then he tried convincing my mom to call “nu”, Cheenu mama, so he could speak to his most favorite person in the world after Kokka, Lakshmi Mami. Mom said no, little did she know that it was the last time he could speak to Mami. He was still feeling sad about his Kamala athai (dad’s sister) passing away – and this athai had fed him lunch once !! Now when we go to Hyderabad, we will miss him and the tea at 11 am will feel sad without Nanu. 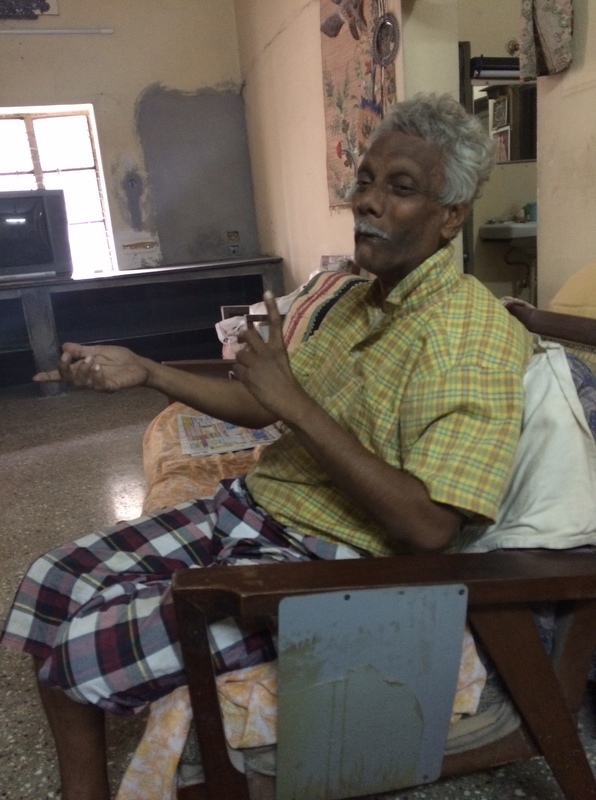 We don’t need any language and no words to communicate – Nanu was a prime example of that. With just a few words that he could speak, he spoke volumes and even over the phone ! Those that knew him, would miss him undoubtedly and Kokka, I know a part of your heart feels empty today. But take it in your stride like Nanu would. He is safe and whole again… as his soul meets Periyamma, Periyappa and Alamelu in the afterworld, he must be eagerly asking them questions :). Rest in peace Nanu and lots of love from all of us. You will be missed and you will be remembered by all of us. Amma, Krishnan and I had a piping hot cup of tea just now, just the way you liked it….. I took this picture last Aug when we were getting our house redone. So sorry for your loss. We miss our loved ones indeed.